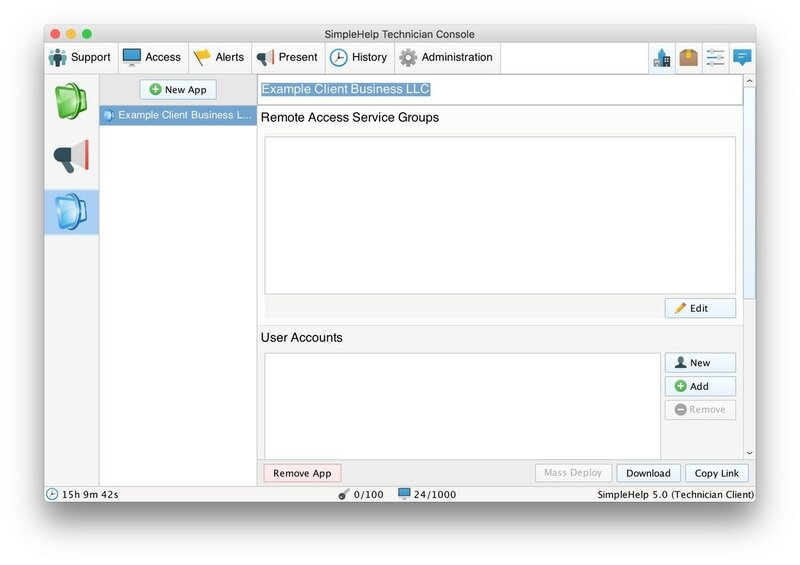 Explains key Business license features for service providers and how to resell use of your SimpleHelp server. At SimpleHelp we strive to build products that not only allow you to get work done quickly and easily, but to allow you to build a profitable business based around IT support and management. 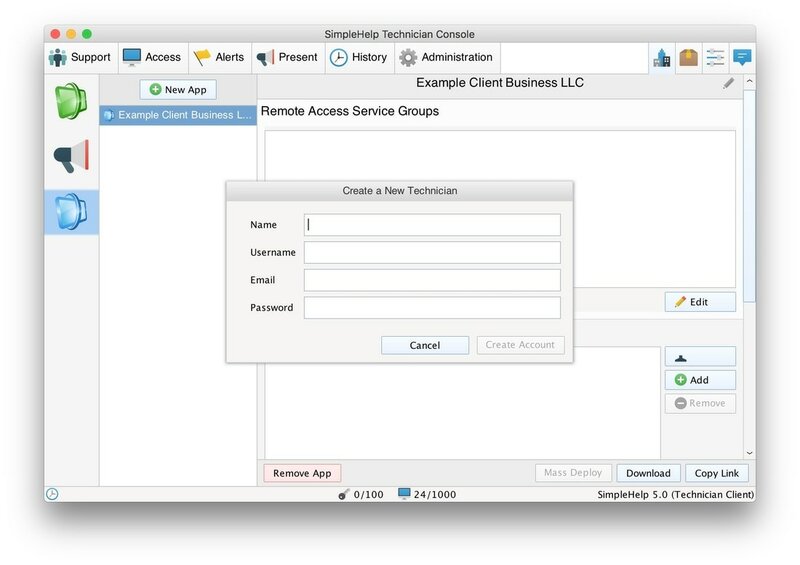 In addition to offering clients monitoring, alerts, automated maintenance and automated responses to alert conditions, SimpleHelp Business and Enterprise licenses also now contain a Provider tab which allows for the creation of simplified apps for remote access and presentations, and easy user management for the provision of these as a service to clients. Selling your SimpleHelp server's abilities as a service rather than just your time using it will allow your business to scale up to new heights. 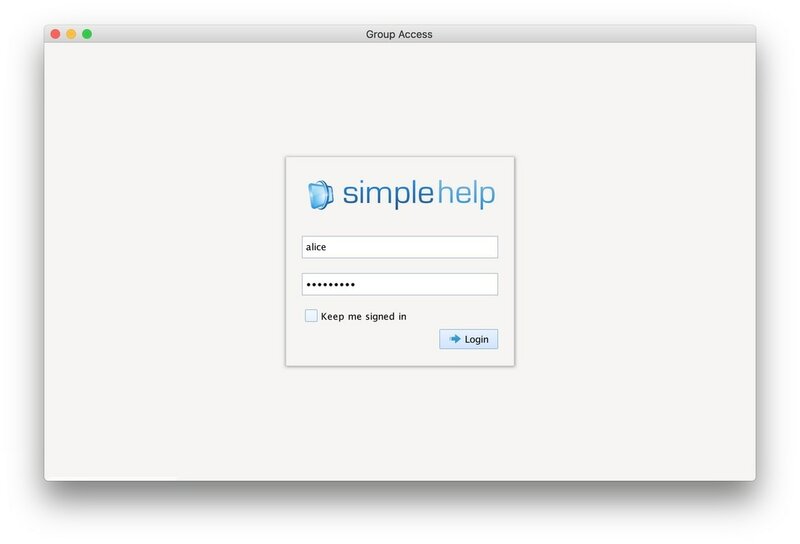 The provider tab enables you to offer use of your SimpleHelp server as a paid service. The current apps may be great for tech-savvy IT people but non-technical client users need something more streamlined and tailored towards their usage. ​The provider tab gives you the option of a few different end-user apps which are simplified for end users to make their experience better and reduce the support workload for you. 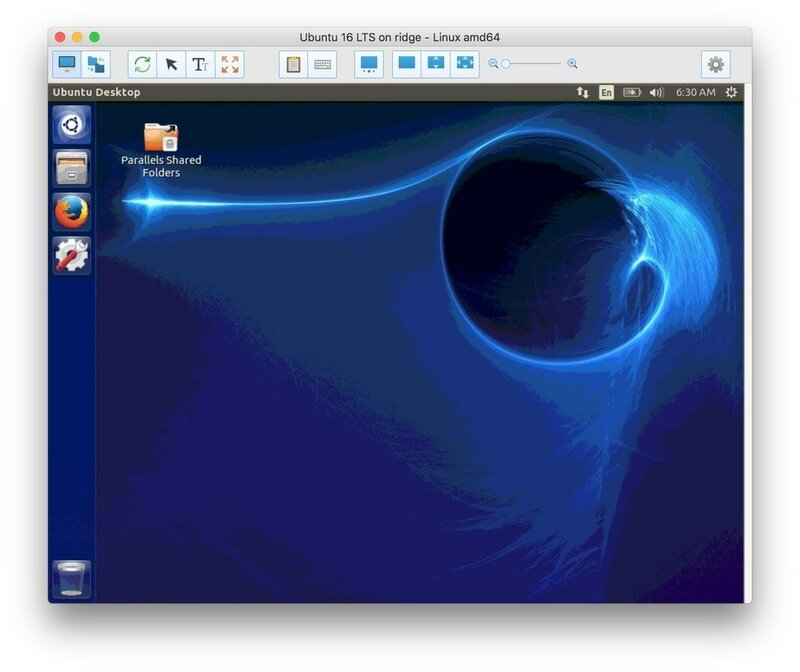 Each of these apps allows you to create a 'profile' which is set up specifically for an end-user group. This profile can be configured for the end user group and also contains account information to manage who can access it. The next section will run through an example Group Access setup where we create a profile for a company we are providing a service to, configure the profile to be restricted to just their machines, and finally create accounts for them to use. A key part of managing your service provision is managing end user accounts, so we've made this as simple as possible. To revoke access at any time, you can just remove the account. If the account is a dedicated account it will be deleted entirely, else if it is a full Technician account it will just be removed from this app profile. 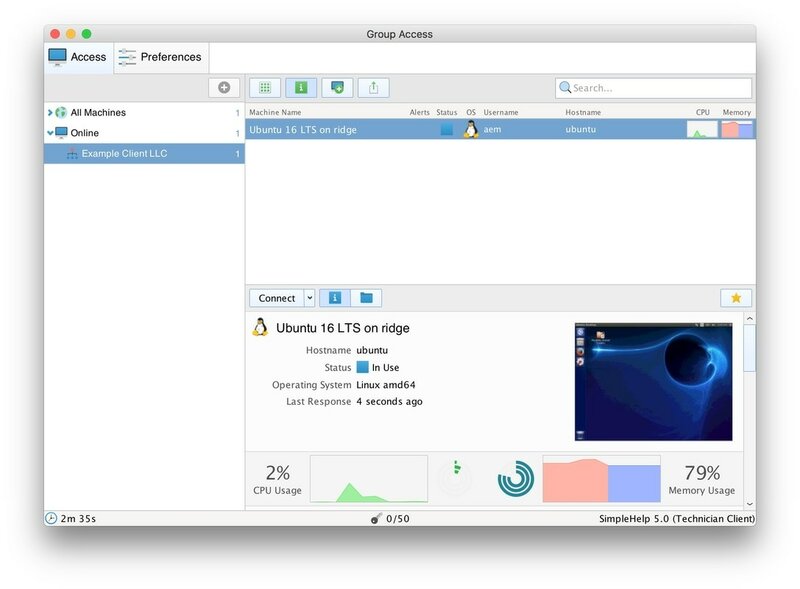 Group Access allows end users to access groups of Remote Access machines with a simplified session window and a limited set of options when connecting. When you've set up the target groups and user accounts, you can click Download or Copy Link to get a download link to distribute to your users. 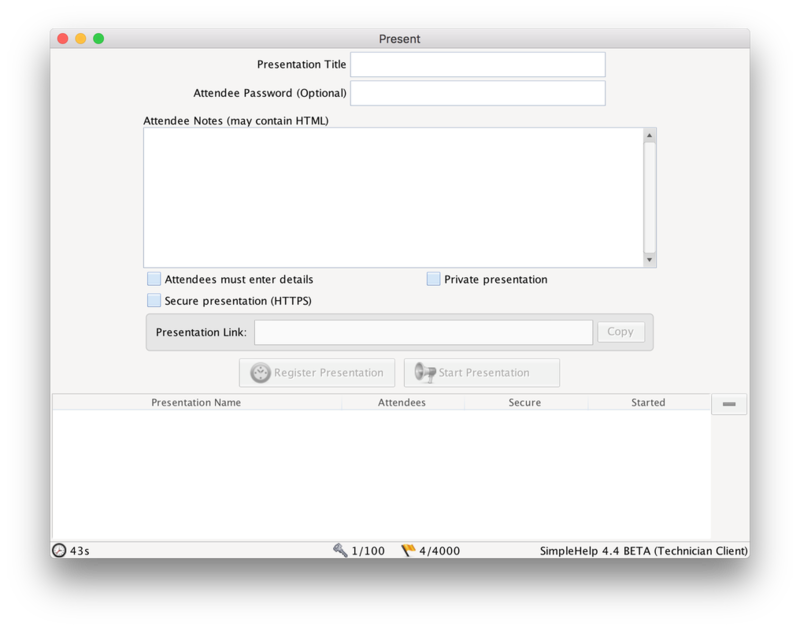 The presentation provider app gives users the ability to share their desktops for presenting and demos but doesn't give them any further access to remote access services. After configuring the user account, the end user can launch the presentation app and use it to share their desktop with whoever they like. If your customer has limited upload (ADSL or similar) you can create a virtual machine for them on a higher bandwidth connection and allow them to use the presentation app on that machine via Group Access to give attendees a much smoother experience.